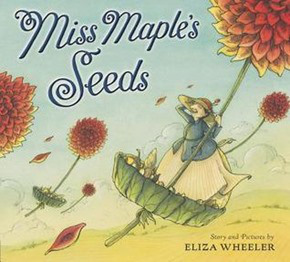 Today we are taking a short break from our Mystery Seed/Seed of the Week features to take a look at a new children's fiction picture book, Miss Maple's Seeds by Eliza Wheeler. I found this book and thought it would be a great tie-in for children interested in seeds. Story: Miss Maple gathers up seeds that haven't found a place a grow and keeps them safe over the winter. In the spring she sends the seeds out to meet their destinies. Miss Maple's Seeds has all the ingredients to become a classic children's book. It has a message about growing up that will resonate both with children and the adults who read to them, saying the biggest of trees come from small seeds. It also subtly incorporates the changes of the seasons to reinforce the theme. The illustrations have a soft, yellowed, old-timey feel. Although this is a fictional tale, one of the illustrations is a page with drawings of 20 different types of seeds (I should point out that the "seeds" from the fern as shown in the book are actually technically spores). See how many you have investigated and can recognize. Miss Maple's Seeds is likely to appeal to children who love nature and enjoy fairy tales. See what ideas it plants in you! Finding this book inspired me to create a list of children's books about seeds at Science Books for Kids. It is a work in progress and I would welcome any suggestions, particularly books about seeds for older children. Book was provided by my local library. Disclaimer: Linked titles go to Amazon for further information and reviews. Just so you know, I am an affiliate with Amazon. If you make a purchase after clicking on one of the links, I will receive a small commission at no extra charge to you, the proceeds of which will help pay for maintaining this website.